this card is for him. I hope they don’t do mono’s like I did when I was around his age!!! without hanging on for dear life! ummm…lucky to be alive still really! and a Darkroom Door stamp. that boys seem to love. And a little distressing for atmosphere and to add a vintage feel! I think the worst part of bike rides is trying to get the knots out of your hair afterwards..
~ Through the Craftroom Door – Anything Goes! Dot, this is amazing and Jake will be so thrilled! Love how masculine this card is and just perfect for the big "18." The "Born To Ride" really pops! Love this and I may be a total coward now, but there was a time I was not! Hugs! Oh gosh yes Dot. Memories of being on the back of a Harley Davidson O:). This is a wonderful card reflecting the love of motorbikes, great techniques and the perfect little embellishment. Happy Birthday Jake. Super cool card! !Love that background! What a stunning card, fabulous background. What a terrific card for your son … beautifully done! Thanks so much for playing at CCCB this week! Thank you too for playing along at Papercraft Star!! Awesome card and colours, your son will love it. This is fabulous i am sure your son will love it. Thank you for joining us at Artistic Inspirations this week. Baeutiful and great card Doth. love the background and the motor bike . I'm sure your son will love love love this card, it's really fantastic. Fantastic motorbike, and your colour blended background is so cool! A great card – your son will love it, I'm sure! 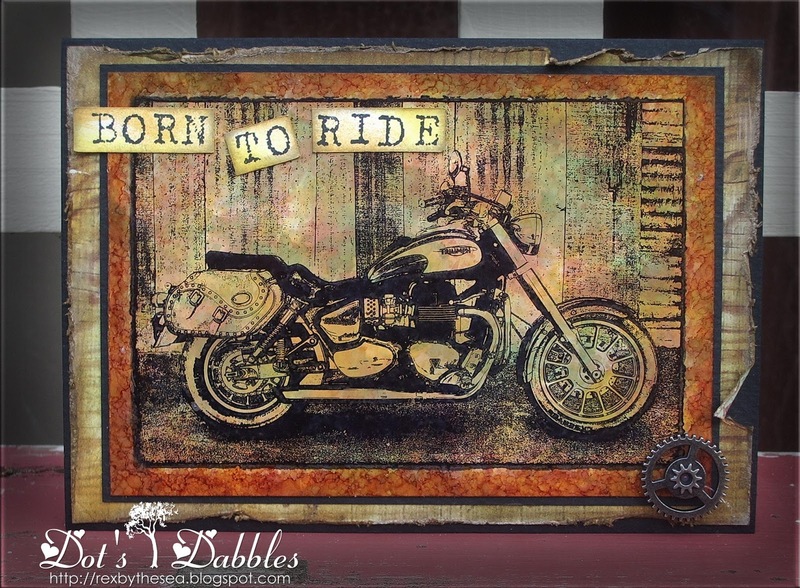 fabulous card, love that motorbike! loved motorbikes, we never wore crash helmets or protective clothing in the fifties and we lived to tell the tale! What a cool card for an 18 yr old b-day- love the AI and the great color you achieved- beautifully done! Fabulous male card… I'm not a fan of motorbikes but two out of three of my children plus a son-in-law are…in spades. They would all love this card. Wonderful and if I don't follow you the rest of my life – I am crazy!!!!!! What a great masculine look…love it, amazing colours Dot! What a perfect masculine card. Your son is going to love it. Thanks so much for playing along with us over at CCCB! What an amazing card Dot.Fabulous and first class. no doubt well recieved too my friend. Wow Dot! This is absolutely fabulous and your background looks just amazing! What a clever effect – love it! Thanks for joining in with my DIY background challenge at MMM and so sorry for the late comment – still trying to catch up! Fabulous card Dot, Jake no doubt loved this!Love the depth of colour your achieved with the AI's. This is so awesome, I love it! Thanks for joining us at It's All About The Vintage And Beauty.